9. With a round file, starting at the tips of the wings, create the edge of the wing. The edge of the wing will blend into the body somewhere near the base. 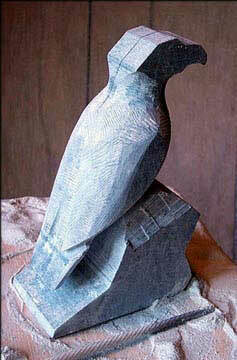 As I have said before, keep in mind the shape of the eagle as you are creating it. Here we have the front and back of the sculpture at this point. 10. 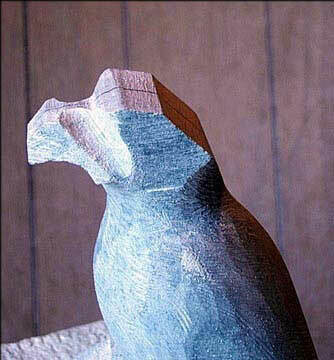 To begin create the head and beak, cut the front of the head to create the the planes of the beak and head, as shown in the picture. Never cut to a the centre line. 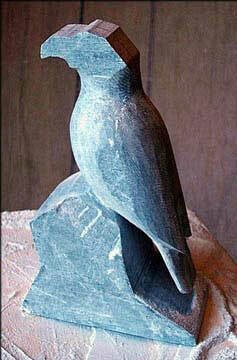 Leave enough stone to allow you to file and sand the beak to its finish. 11. 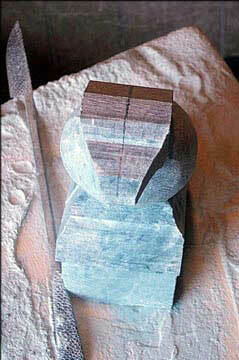 The first cut to form the area where the beak meets the head is made with a large round file. Starting at the bridge of the beak, cut down and back to define the separation between head and beak, as shown in the picture on the left.